Harry ‘Dealer’ Wells was a dashing centre who could have easily plied his trade in country leagues around NSW if not for fate and his exceptional abilities, which delivered state and national jerseys and a Sydney premiership during a rugby league career that lasted two decades. But despite his record, the name Harry Wells is lucky to be in the record books at all, let alone as an inductee into the Sport Australia Hall of Fame as an athlete member for rugby league. 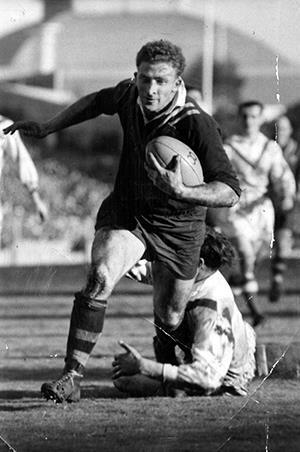 Harry Wells played 29 tests for Australia in a career that saw him play for South Sydney and the Western Suburbs club teams in addition to representation for NSW and at three World Cups for the Kangaroos. In his first year in Sydney, having moved from Wollongong, he played in the 1951 premiership winning side with South Sydney in their 42-14 win over Manly alongside fellow Sport Australia Hall of Fame member Clive Churchill. “I was picked as a reserve grader and the only time I played first grade was when someone was injured,” Wells, now 84, recalled. Despite boasting a premiership win, Wells decided to move back home, and as fate would have it, he feels the decision was the secret to his rapid rise though the rugby league ranks. “I’d played a handful of first grade games and played in the grand final but over the summer period I thought if I go back to Souths again, I’m only going to go back to reserve grade and I didn’t feel I was getting anywhere so I went back to Wollongong,” Wells said. In 1952 good form in Wollongong saw Wells picked in the Possible’s versus the Probable’s resulting in selection in the NSW Country side. A good game resulted in selection for NSW and he again played an eye-catching game. “That night I got picked for the Kangaroos. If I hadn’t done what I did, I probably would have still been playing reserve grade for South Sydney,” Wells said. The 1952 tour saw the first of 29 test appearances. He represented Australia in eight World Cup matches across three World Cup campaigns in 1954, 1957 and 1960 and formed a strong combination with Sport Australia Hall of Fame legend and member Reg Gasnier - with the duo playing 12 tests together. Despite playing for state and country it wasn’t until 1956 that Wells returned to the Sydney premiership, this time with Western Suburbs. The club was dubbed ‘the Millionaires’ as they lured a string of high profile players in an effort to win the premiership. He played 85 games for the ‘Magpies’ from 1956 to 1961 where he scored 32 tries and captained the club in the 1958 grand final loss to St George, who were three years into their incredible 11 consecutive premiership wins. Three further seasons at Wests' preceded a return to the country before retiring in 1972 at the age of 40 – after two decades in the game. After a lifetime in league, Wells was named at centre in the Western Suburbs and West Tigers Team of the Century and in 2007 he was inducted into the Australian Rugby League Hall of Fame. He is Patron of the Mid North Coast NSW Men of League. Born Harry Wills, Wells came from a family of boxers. Both his father and grandfather fought under the same name ‘Dealer’ Wills and Harry displayed many of the skills from the ring in his career as a centre. “I was born Harry Wills - I played all my junior football until I was 18 as Harry Wills,” Wells says. “My Grandfather just let it go and didn’t correct it and he finished up ending his career as ‘Dealer’ Wells and my father did the same – he became ‘Dealer’ Wells. According to Harry – “the only time I’m a Wells is when I’m around a footballer,” or when being inducted into the Sport Australia Hall of Fame. Harry Wells will be inducted to the Sport Australia Hall of Fame on Australian sport’s night of nights – the sold out32nd Sport Australia Hall of Fame Induction and Awards Gala Dinner, held at Palladium at Crown, Melbourne – presented by Etihad Airways.